The Bellavista Hostel, Santiago, Chile : Rezerwuj teraz! Serving the world since 2002! 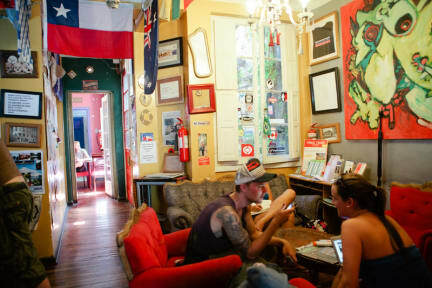 The Bellavista is a small hostel with big flavor. We are located in the capital’s coolest district in Central Santiago: Barrio Bellavista! This quirky area is famous for its alternative culture and is the favorite of backpackers visiting Santiago. This hostel-hood provides everything you need from great food, bars n pubs, outdoor fun, art, live music, festivals and so much more! We don’t like to brag, but we do have it all: awesome staff, free wi-fi, free basic breakfast, self-catering kitchen and laundrette. We also provide free luggage storage for you on the day of your arrival and check-out. The Bellavista also organizes fun stuff for you to do! Free Walking tours, Pub Crawls, wine tastings, BBQs, movie nights… well, you get the drift! 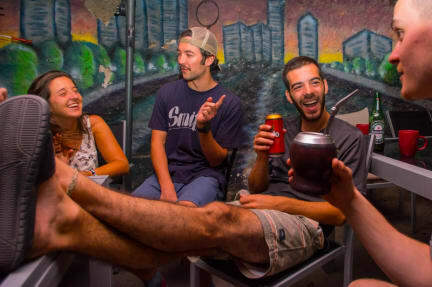 It’s a fantastic way to meet other travellers and really make the most of your time in Santiago! Find out what’s happening in The Bellavista, or at La Chimba (our sister hostel a few block away) while you’re staying with us - ask for the itinerary when you check in.